Lynne Taylor » Follow me? bible gateway identifies 20 times in the gospels when Jesus says “follow me” (yep, some are synoptics). 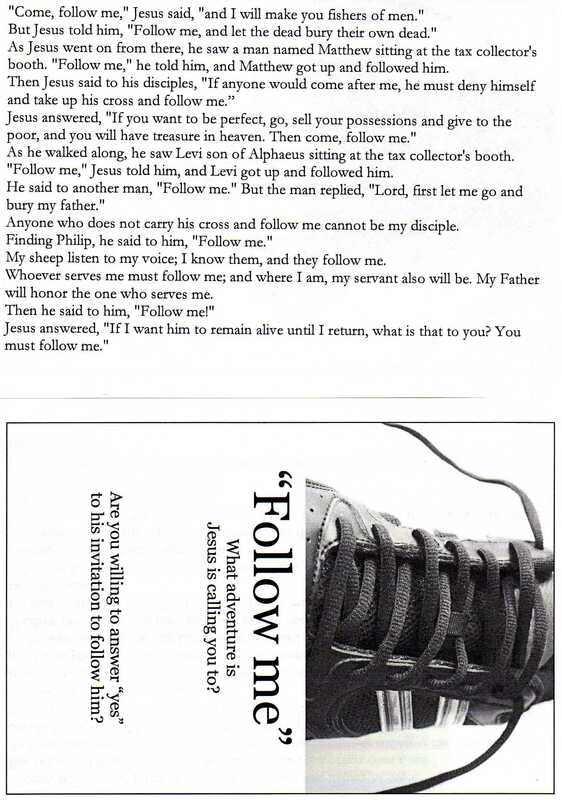 And so, for our ending for Espresso last night, i printed out those “follow me”s, spread shoes around and asked people to think about what Jesus is asking them to follow him to …. and whether are they prepared to say yes. It was nice to be reminded personally that my mothering and my being alert to what God is up to in people’s lives, is part of my following of Jesus. And nice to sign up, to say yes, to ongoing following… wherever the adventure may lead. What adventure is Jesus calling you to? It is an interesting question Lynne and one which I am more and more thinking that is one that will never end. Although I have tempered myself from my youthful days of “Is that all your’ve got for me God go on bring it on!” (be careful what you wish for and all that) I wonder if we at times hear the call follow, it becomes after an inital time of trial comfortable, and take the risk in that comfort of missing out. That in giving ourselves over to the very possibility of dropping our comfortableness and following, we in fact risk catching something spectacular and new, of opening ourselves up to the wonderful unpredictability of God.